In July, over 100 people, including our own Murray Wilkinson, gathered at Brighton University to hear John Westerhoff, best know for his theory of styles of faith. Mary Hawes writes of her experience below. Together we explored how to build communities of faith in which to nurture children and young people. He urged us to move away from a schooling-instructional paradigm towards a community of faith-enculturation paradigm, characterised by experience, reflection and integration. If you’d like to see what people tweeted about it, the Twitter Stream is here. Much of what he said is contained in the third edition of his classic “Will our children have faith?” If you haven’t read it, do so and join the conversation which is asking how we can rethink what we currently do in churches. 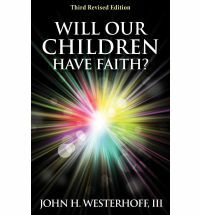 “Will our children have faith?” by John Westerhoff. Available to borrow from the ChYP’s library.